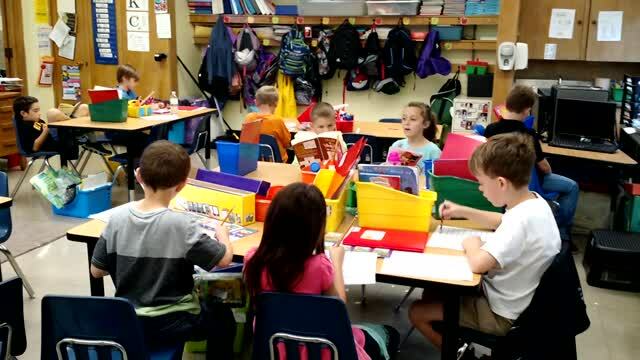 Click on the link below to see Daily 5 in action in one of our classrooms! Our Kindergarten through 2nd Grade classrooms learn important concepts and phonics rules using the Wilson's Fundations Program. Based on the Wilson Reading System principles, Fundations provides research-based materials and strategies essential to a comprehensive reading, spelling, and handwriting program. Students work with words in a multi-sensory, structure way with the expectation that these skills will transfer into their independent reading and writing. For more information, speak with your child's teacher and visit Fundations Support for Parents. Our 3rd through 5th grade teachers realize that students continue to need phonics and word study support when they advance from early elementary. It is at this point that our phonics instruction continues through a "word study" approach. We use a Developmental Spelling Analysis (DSA) to identify students' strengths and areas of needs. They then work with word sorts and activities within an individualized and appropriate word pattern until mastery is shown. As with any phonics or word study instruction, our goal is to see these skills transfer into and strengthen students' authentic writing abilities. All Ohio Schools are required to identify any K-3 student that appears to be struggling in reading based on a specific criteria set by individual school districts. Riverside Local Schools uses the MAP assessment as a measure of reading readiness for each grade level. Our schools will provide help and support to make sure students are on track for reading success by the end of third grade. To do so, we create Reading Improvement and Monitoring Plans (RIMP) for each individual student who has not met the requirement. This plan is sent home and includes assessment information, as well as a list for interventions that will take place to strengthen a child's reading abilities. The links below will provide further information. Please do not hesitate to contact your child's teacher with your questions or concerns. Daily 5 in Action in a Riverside 2nd Grade Classroom! We are very excited to be piloting the Lucy Calkin's Units of Study from teacher volunteers across grades K-6 this year! The involved teachers participated in a week long summer course that acquainted them with the components and philosophy of the "writing workshop" model. This approach involves exposing students to specific techniques and strategies across the genres of narrative, opinion, and informational writing. Students work thorough the writing process within these genres with strong support from the teacher through whole class, small group, and individual instruction. Teachers are not only seeing the benefits of this method of instruction, but the students are enjoying it as well. It increased the amount of writing they have done in the past, but since the topics are student-driven, our young writers are writing with purpose, motivation, and higher interest. The Write Tools is a organizational method to help students strengthen their informational/essay writing. Students using the Write Tools are able to create a topic sentence, develop supporting details, and end with a clear and concise concluding sentence. Using the Write Tools, early elementary students may write paragraphs to include 5-8 sentences, while upper elementary students could include 3-4 paragraphs. Here at Riverside Local Schools, we utilize the Eureka math program, which teaches math as a story. At the elementary level, the story is about units. The idea, that mathematics is the same for all units; whole number, fractions, and decimals, carry over each year. It is not enough to get an answer; students need to understand why a process works so they can apply it to alternative situations. In each grade, we focus more deeply on fewer concepts. Teachers introduce more strategies and listen as students explain their reasoning. Elementary teachers are preparing students for mathematical success. "Living and nonliving things have specific physical properties that can be used to sort and classify. The physical properties of air and water are presented as they apply to weather." "Energy is observed through movement, heating, cooling and the needs of living organisms." "Living and nonliving things may move. A moving object has energy. Air moving is wind and wind can make a windmill turn. Changes in energy and movement can cause change to organisms and the environment in which they live." "Matter is what makes up all substances on Earth. Matter has specific properties and exists in different states Earth’s resources are made of matter, can be used by living things and can be used for the energy they contain. There are many different forms of energy. Each living component of an ecosystem is composed of matter and uses energy." "Heat and electrical energy are forms of energy that can be transferred from one location to another. Matter has properties that allow the transfer of heat and electrical energy. Heating and cooling affect the weathering of Earth’s surface and Earth’s past environments. The processes that shape Earth’s surface and the fossil evidence found can help decode Earth’s history." "Cycles on Earth, such as those occurring in ecosystems, in the solar system and in the movement of light and sound, result in describable patterns. Speed is a measurement of movement. Change in speed is related to force and mass* . The transfer of energy drives changes in systems, including ecosystems and physical systems."